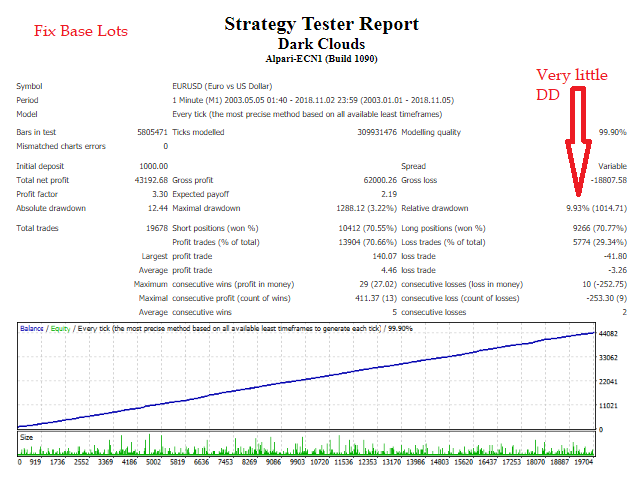 Dark Clouds is a fully automatic Expert Advisor for Scalping Trading and Intraday Trading. 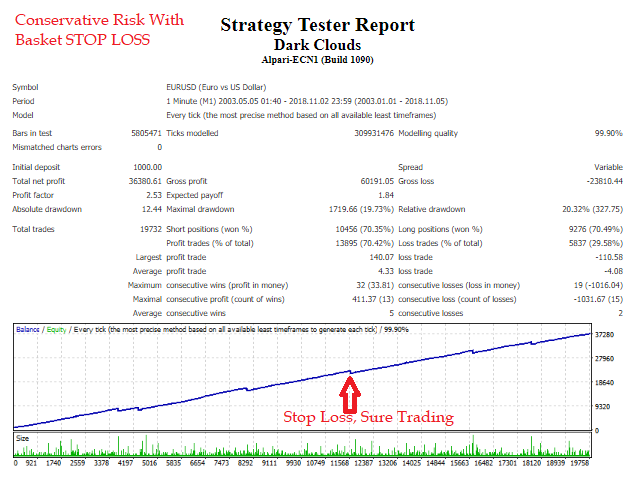 Dark Clouds is based on an artificial intelligence algorithm that allows to predict and anticipate the trading Signals that it uses. In this way, the expert advisor is able to get a very high-rate of winning trades. The Expert was tested on the whole available historical period in EURUSD with exceptional results. You can download the demo and test it yourself. My tests were performed with the real tick date with 99,90% accuracy, actual spread, additional slippage and High commission. The Expert Advisor uses Special Algoritm DC* to identify the entry points. You can find the complete list of parameters in the parameters section blog. This Expert Advisor uses a pyramid strategy. The default settings can open a maximum of only 15 orders; The use of the news filter is recommended. In addition, too much settings are external, so that everyone can set the robot as they wish. The Recommended Timeframe is M1. It is not recommended to use other timeframes for this robot, because they can only compromise the accuracy of the operations. The recommended pair is EURUSD. no use this robot in other pairs. It is recommended to run the robot with the default settings or by changing the risk to medium risk or conservative risk. The recommended Leverage is 1:200 or more and minimum deposit recommended starts from $2000. Risk Percent: if the money management option is enabled, it indicates the risk percentage. how to calculate Risk? Max Pyramid Order: maximum allowed position at the same time. Coeff Pyramid: Position increase coefficient. Min Distance: Min Distance For new Position. 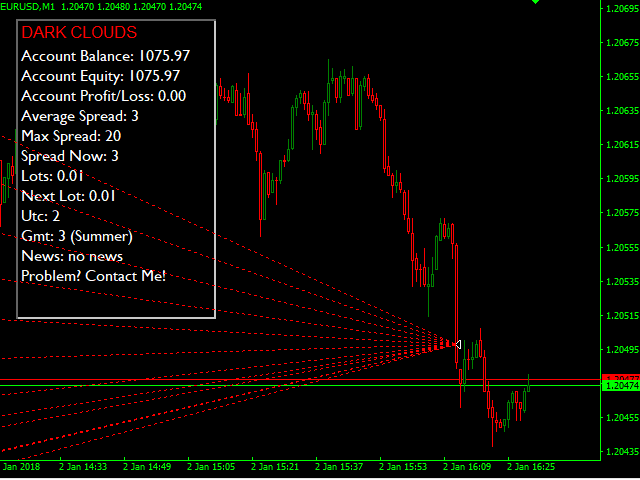 Take Target: Basket Profit target in points. Stop Target: Basket Loss target in points. how to calculate? Auto UTC: Auto UTC Detect. Broker UTC = Usually 2, contact me if you're not sure or check Recommend Broker. Enable News Filter: if true enables news filter. Enable High Impact News: if true enables news filter on High impact news. Stop Minutes after High Impact News: Minutes after news for stop trading. Stop Minutes Before High Impact News: Minutes before news for stop trading. Enable Medium Impact News: if true enables news filter on Medium impact news. Stop Minutes after Medium Impact News: Minutes after news for stop trading. Stop Minutes Before Medium Impact News: Minutes before news for stop trading. Enable Low Impact News: if true enables news filter on Low impact news. Stop Minuts after Low Impact News: Minutes after news for stop trading. Stop Minuts Before low Impact News: Minutes before news for stop trading. Auto Gmt: Auto Gmt Detect. News Broker Gmt: Broker gmt. (usually 2 or 0). Show Panel: Show Info Panel. Very supportive from Marco. And when you use Dark Cloud correctly with the right deposit and risk management, it provides you with fair return. A lot of people complaining hitting SL or losing big money maybe due to incorrect settings. I think all buyers shall do their backtests and determine the risk acceptance level. Deposit can’t be less than 2000. It’s quite a few months to earn back the robot fee of USD490, but in the long run it earns. A very good robot that backtest from 2003 to 2019 with no major loss. If you had ever done your backtesting on this EA, you will understand it can hit 100000 points stop loss which will wipe out $1000 in mere hours. This incident happens 2-3 times a year in average, yet it can still earn back your money if you don't get angry and give up. SL is part of the game and this will happen someday sooner or later and this is a known risk. I still have much trust in this EA, thinking any grid will be good forever is just pure unrealistic. Horrible EA. I had a small account to begin with, and now it's down to almost nothing. When contacting the creator, was told that I would get it back. WRONG! There is no intelligence in the trades. It will open trades against obvious signals. Total waste of money to buy it, and total loss of what little money I had. Don't buy this. Dark Clouds been kind to me lately, I know some of the user hit SL. so, five star from me. Horrible EA. No intelligence in the trades. Opens trades against obvious signals. I lost $13K in 2 weeks. Don't buy this. This is Good EA ...but you need to find the right set . With proper management, the ea is profitable on the long run with conservative risks. As all grid systems, stoploss must be configured and ea must be checked. Recently had major losses. I have removed it from my account. It made very terrible trades on 2019.1.25 which made my real account lost $7000. The first trade of the grid open an sell order when was an RSI low and that's not quite reasonable. Marco have to check this issue. I also notice that Joshua Mondragon has already removed this EA form his MyFXbook portfolio. I know it's risky when using the grid system and complain doesn't solve problem... I wish Marco could find some way to fix it. Looking forward to the future version. i lost 2000 dollars with it !!!!!!! Poor Grid ...Please dont buy ...didnt even last a month. Для сетки важнее всего логика входов. Тут она явно хромает. Часто на Хаях открывается бай, на лоях - селл. это очень опасно, т.к. запас прочности у системы очень не большой, 110 пп против позиции убивают пол депозита. Настораживает так же то, что в тестере я проверил каждый месяц, начиная с апреля 2013 года, стартуя с 1000$ депозита, и ни разу стоп лосс не был получен. А в реальной торговле советник не проработал и 2 месяцем до первого стоп лосса. Хорошо, что это пока демо. Посмотрим как быстро отработает просадку и не будет ли новых стопов. На реал пока ставить не рекомендовал бы ни кому. Пока три звезды за отзывчивость автора. Так же спасибо ему за идею торговли на ТФ М1, которую я использовал в своём советнике. The author learned a lot since publishing his first EA. This is a grid advisor with risk control. Marco always responds to all questions at PM very quickly. The Author deletes ( or hides ) his MT4 signal where a basket stop loss happens. He also deleted the youtube channel. This is not honestly. Decreasing my rating to 3 Stars because of that. Exceptional Support. The EA at the moment very safe. Very risky. Without money management. Risk of full account loss. Definitely a 10 star if I could. Managed Draw down very well with sets. 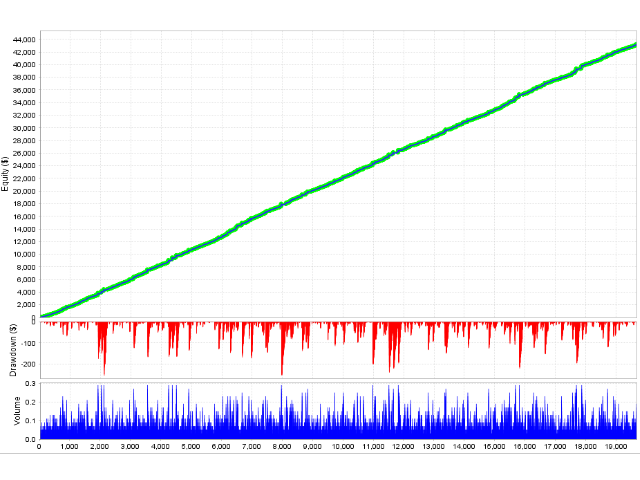 It works in 99.90 TDS backtest and also in live. Definitely one of the EAs I would run from 2018 and now into 2019. If you follow author Marco's EAs closely and comments, hes dedicated and made his own telegram group. Reachable instantly! The EA is robust; and Marco's assistance is quick and efficient. Following the suggested parameters and the community discussions, the EA behaves very similar to the backtests. I am really satisfied with the Dark Clouds. 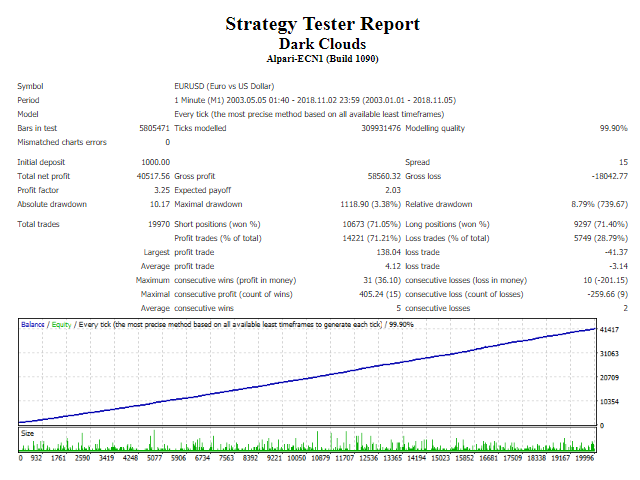 Dark Cloud is a very interesting EA in the category of Grid, Martingale trading systems. Even if many traders consider types of Martingale money management a "No-No" option, I'd disagree since all the money I have made until now in my career is from this kind of Money Management Systems. Marco is supportive, and every time he tries to solve a problem. I recommend this EA. Many personal thanks to Marco for his work. Also, the stop loss basket is great and better than any other grid that doesn't close the trades at any level till your account hit the margin call ! 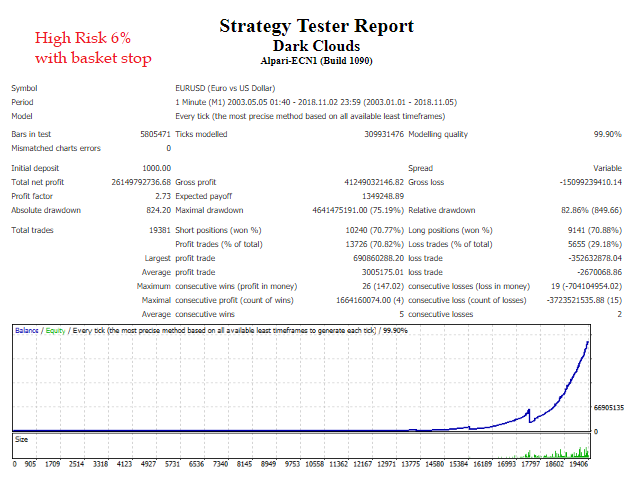 Similarly to Grid Hero and WolfGrid EAs, DARK CLOUDS is another superb cost-averaging (alias "Martingale") EA which has become the 3rd member of my "Grid Trinity" portfolio. The EA's backtest results are excellent with tolerable drawdowns at medium risk settings. Live account results nicely match backtest performance - as confirmed by other users -, so my rating is also a solid 5-Star. Support by Marco is outstanding what only adds to the value of this exceptional EA which will probably rise to the "Top 3" of MQL5 soon (most likely at a higher price) as long as its live performance continues to match its backtest results. So far in my opinion one of the best grid systems in the market. I'm sure that this EA will head to place #1 on the MQL5 market. 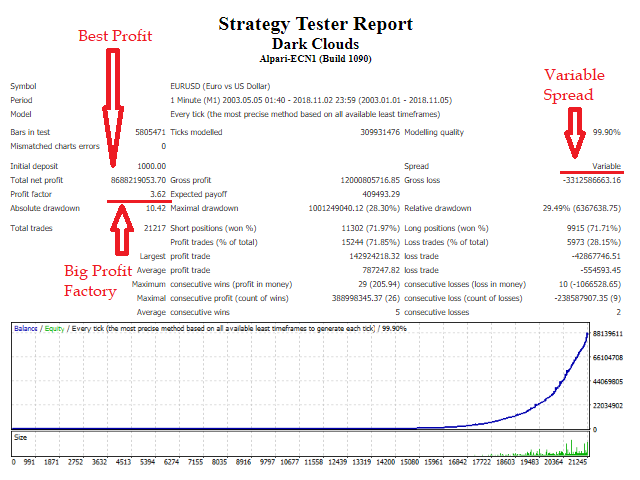 I'm running Dark Clouds on demo and several real accounts and so far the backtests match the live results. Great support from the author! He's reacting very fast to questions and is very supportive. I like this product. The backtests are great and Marco's support is amazing. Will give it a 5 star to support Marco the way he supports his GOOD products. I’ve been using this EA since its launch. So far, the performance is very good, and the risk taken seems reasonable (always coherent with author remarks and back test). In addition: great support from the author, answering fast and properly all the question. I fully recommend. 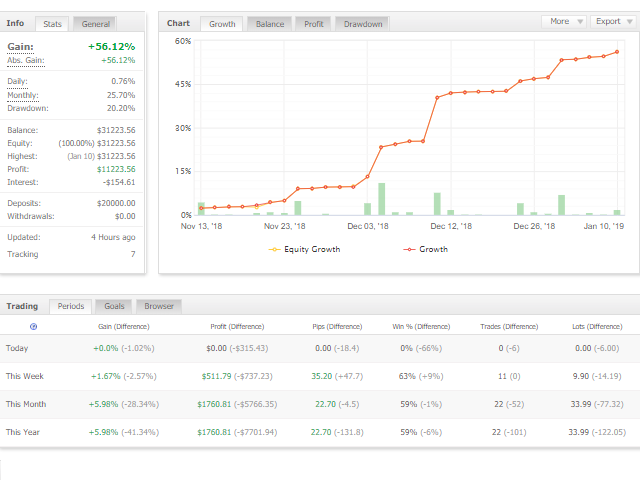 Update after 3 months: very consistent results with Basket_SL set. Low DD and good profits every month. Fully recommendable. Great product, good profit. Super and fast support. I highly recommend it! I have bought Dark Clouds because I have ever bought an EA from the provider and the class works and is still running. After many tests, I decided to buy Dark Clouds as well. I can only say that I am completely excited about the EA. - Add new settings: New Open Period. - Now you can use accounts with basic currency: USD, CHF, AUD, EUR, GBP, JPY, RUB,HUF, CAD, NZD, PLN, CNY.